On Wednesday, May 25th, the House Natural Resources Committee, under the leadership of Chairman Rob Bishop (D-UT), passed the Puerto Rico Oversight, Management, and Economic Stability Act (PROMESA) with 29 votes in favor, 10 votes against, and 1 member voting present. Since that vote was taken, a number of groups have come forward to recognize that while the bill would not have been their first choice for Puerto Rico, the legislation should progress. Others – from both sides of the political spectrum and from within and outside of Puerto Rico – have simply opposed. The HNBA noted in its statement that the organization supports the restructuring provisions in the legislation but would like to see additional changes, notably a reduction in the oversight board’s “seemingly endless powers over Puerto Rico affairs.” The HNBA emphasized that “any such mechanism, if ultimately adopted, must be respectful of the democratically elected officials of Puerto Rico, as well as its government institutions and the people who live and work in Puerto Rico.” The statement further explained that “the Board should include more participation from residents of Puerto Rico, either through appointment of a higher number of residents to the Board, or through a mechanism in which the Governor or the Legislature can recommend residents of Puerto Rico for appointment to the Board.” The HNBA also expressed concern about the provisions of the proposal requiring the Government of Puerto Rico to pay for the cost of the Board. Congressman Raul Labrador (R-Idaho) voted in favor of the bill, calling it a “conservative solution.” He was quoted by El Nuevo Dia as saying that special interest groups fought against it in hopes of triggering a catastrophe in Puerto Rico which would force a taxpayer bailout of the territory. H.R. 5278, he said, will “restore stability and revive the economy of Puerto Rico” without any cost to U.S. taxpayers. Senator Bernie Sanders (D-Vermont) opposes the bill, claiming that the oversight board reinforces a “colony-like” relationship between the U.S. and Puerto Rico. Sanders wants the Fed to buy Puerto Rico’s debt and free the territory from it, something government officials say they cannot legally do. Speaker of the House Paul Ryan’s (R-WI) press office curated a collection of quotes from a variety of leaders affirming that H.R. 5278 is not a bailout, and indeed will protect U.S. taxpayers from a bailout. Congressman Luis Gutierrez (D-Illinois) is troubled by the degree of control granted the fiscal oversight board the bill will establish. “The priorities in this legislation simply do not match my priorities when it comes to honoring the people of Puerto Rico and trusting in their ability to rule themselves,” he said in a press conference. Peter Roff of U.S. News and World Report is calling PROMESA “typical Washington tripe.” Roff is calling for the “abolishment” of the minimum wage, collective bargaining, and public employee pensions. 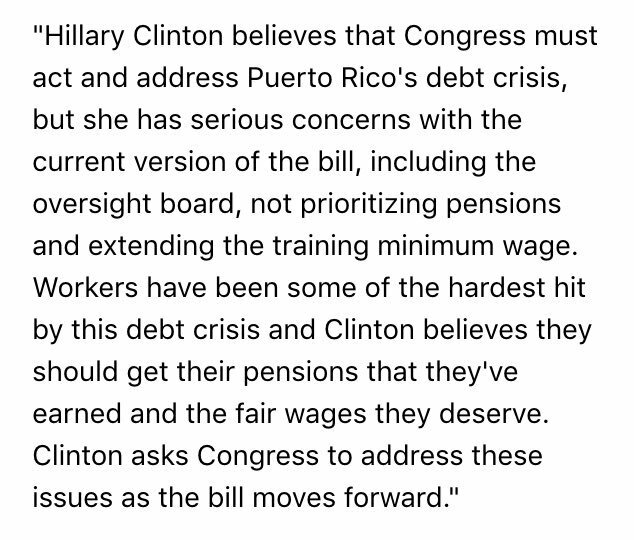 Hillary Clinton says that she has “serious concerns” about the bill, including the minimum wage and pension factors as well as the oversight board itself. She asks Congress to address those concerns as the bill moves forward. Twitter offers opinions ranging from “#PROMESA is a slap in the face to Puerto Rico” to “La #PROMESA de la prosperidad Americana.” It’s fair to say that there is no consensus in social media; some favor PROMESA, some oppose it on right-wing grounds (Puerto Rico doesn’t “deserve” it, for example, or it doesn’t support Wall Street sufficiently), and some oppose it on left-wing grounds (that it doesn’t support Puerto Rico’s workers, for example, or that the fiscal oversight board is undemocratic). The wide disparity of opinions in Puerto Rico and on the U.S. mainland may be a hallmark of the democratic process, but they may also presage a tough battle in Congress to get the bill passed.